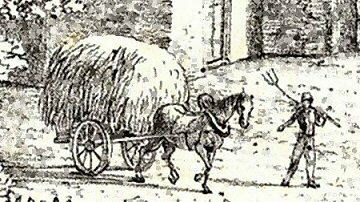 The following article entitled "The Medieval Farming Year" is the work of Andy Staples, an amateur medieval archaeologist, and is included simply because I would not be able to write anything more appropriate, and because it fits perfectly with the aims of this site. There was an abridged version of Andy's article on this site previously, but, due to an oversight on the part of the Webmaster, there was no attributation given in respect of Andy Staples as being the Original Author, and no acknowledgment of his copyright ownership to the material in question was given. I unreservedly extend my apologies to him at this stage for making use of his work without the appropriate acknowledgments, and am indebted to him for allowing us to make use of his complete work in this regard. This article is my attempt to redress the balance, at least in my own mind, and it is far from perfect. But whatever its faults, it is the most complete and detailed overview of medieval agricultural methods available on the Web at the time of writing - this I know because I have searched long and hard without success for something like it to save me the effort. It is based both on medieval English sources such as Walter of Henley's Husbandry, and on the work of modern historians derived from these sources, primarily H.S. Bennett's Life on the English Manor, supplemented with a little input from archaeological evidence. A full bibliography is given at the end of this file. The research has been long and hard, though immensely satisfying. If you do choose to copy and/or distribute the file, do me a favour and leave the text unaltered and my name attached, and if you wish to quote from it please name your source. Comments, additions, corrections and criticism can be sent to me by e-mail at: andy.staples@gmail.com. When using the calendar you should be aware firstly that it concerns England during the 12th to 13th centuries, although it should be fairly valid for northern France and Germany. Secondly, the exact timing of the works described would be decided by villagers (or by the reeve and the lord or his representative in the case of demesne lands) depending on the local ground conditions and the weather. Finally, it assumes the "classic" midland system of open field farming with two or three great fields worked in common with heavy ploughs. The midland system was not the only one used in medieval England, never mind Europe, nor was it the most efficient, but discussion of other systems is beyond the scope of this article. The innovation which marked the heavy plough from the earlier ard-plough (also known as a scratch- or hook-plough) was a mouldboard mounted on the right hand side, behind the ploughshare, which turned the sod. Because of the difficulty in turning the plough, the team worked in long strips, turning clockwise several times before starting on a new strip. This method resulted in the sod constantly being thrown in towards the middle of the strip, creating a pattern of ridge and furrow. Ploughing the fallow and sowing spring crops continued into May if necessary. Children would defend the newly-sown seed from crows and other marauding birds with slings: only the lord's doves were sacrosanct and killing one brought a heavy penalty. The doves could cause considerable damage to crops and they were a hated symbol of the lord's power. Gardens also required attention. They were used not only to grow such staples of the peasant diet as cabbages and members of the onion family (onions, leeks and garlic - though Hârniacs should note that onions are not known on Hârn) but also cash crops such as flax and hemp. Dyeplants like madder (red), woad (blue), dyer's greenweed (green) and weld (yellow) were also grown in gardens, probably for home use as well as for sale initially, but increasingly as a cash crop as the clothing industry became more urbanised in the 13th century. Culinary and medicinal herbs detected by archaeobotanists include parsley, fennel, celery, camomile, mint, summer savoury, catmint, mustard, opium poppy and coriander. Haymaking was the main event of June, and it was a communal activity. Meadows were relatively rare, and those outside the lord's demesne were often held by the villagers in common. Haymakers used long-handled scythes to cut the grass close to the ground. Teams of men moved down the meadow in lines, each expected to mow about an acre a day. Women and children followed to turn the hay behind them to ensure it dried evenly. Finally the hay was gathered into large stacks. In some areas custom dictated that haymakers could carry away as much of the lord's hay as they could lift on their scythes without letting it fell - letting any part of the scythe or bundle touch the ground resulted in forfeiture. Lambs were weaned as early as possible, for sheep's milk was rich and highly prized. Shearing began late in June. The best fleeces came from wethers (castrated males), and fleeces taken earlier were often finer and more valuable than those taken later in the year. Lambswool is extremely fine, but medieval sheep did not start to produce decently-sized fleeces until their third or fourth year. In areas where three ploughings of the fallow field were the norm the second was generally begun in late June. This ploughing was a little deeper than the first to expose the roots of weeds, and as much manure as was available would be spread on the field before the teams began their work. The easiest way of getting the dung onto the field was to pasture beasts there. Each acre could support two sheep; cattle required about two acres each. Manorial lords often insisted that beasts were folded on demesne lands overnight to ensure they got most of the valuable manure. The beasts were not permitted to graze the meadows until at least a month after the haymaking to give the grass a chance to recover. Between the hectic days of haymaking and the summer harvest the loathsome task of weeding the crop-bearing fields was the most important task. Thistles were among the most common weeds, and tradition held that thistles cut down before St John's Day (June 24) would multiply threefold before the main harvest. Other weeds common in medieval grain fields were dock, dead-nettle, charlock and corn cockle. Corn marigolds grew among spring-sown barley, and cornflower was associated with rye. July was the hungry month. Grain stores were at their lowest ebb, awaiting replenishment from the forthcoming harvest, and peasants in need eked out their diet by foraging and many no doubt by poaching. There is even a theory that rye infected with the hallucinogenic mould ergot was deliberately baked into bread to ease the gnawing hunger with a drug-induced daze. Wheat was harvested with a sickle, used to cut a couple of hands-breadths below the ear of corn, leaving the long stubble standing in the field. The other grains were cut closer to the ground with a long-handled scythe. A team of five people - four reapers and a binder - could harvest two acres of crops a day. The process was not terribly efficient, and some of the grain fell to the ground; the poorest peasants often had the rights to glean the fallen grain from the fields after the harvest was brought in and before livestock was released to graze the stubble. Gleaning rights were hotly contested and seem to have been of considerable benefit to the recipients. Church tithes - one sheaf in every ten - were collected from the field before peasants carted their crop to their barns and houses. Medieval harvest yields have been widely studied, and often hotly debated. They varied widely from year to year, depending largely on the weather conditions. In intensively farmed areas they could reach 1:10 or even higher, but were nowhere near as respectable in the open fields of the midland belt. According to Titow's study of the Winchester data between 1209 and 1350, bad harvests (where the yield was 15 per cent or more below the average) occurred about one year in eight and good harvests (where the yields were 15 per cent or more above the average) about one year in 20. If poor weather delayed the start of the grain harvest, it would be finished in early September before the peas, beans and vetches were harvested. Work was not finished when the harvest was complete, although the pressure eased a little once the sheaves were safely brought indoors. But the grain still required processing. First it was threshed with a flail to separate the individual grains from the ear. The grainflail consisted of two lengths of wood, the handstaff and beater, joined by a leather thong. A worker could thresh about seven bushels of wheat in a day, or eight bushels of rye, 15 of barley or 18 bushels of oats. After threshing the grain was winnowed to remove the chaff and straw. This could be done by throwing the grains on a winnowing sheet and letting the wind blow the lighter chaff and straw away, or by using a special winnowing fan. The chaff and straw was not wasted but carefully collected to use as animal fodder. Finally the grain was sieved to remove the smaller weed seeds. It was then ready to be stored. It would last several years if kept dry and free from vermin, but this was not always easy. Flour had a much shorter shelf-life, and milling the grain was done as and when necessary. By mid-September beechnuts and acorns were ripening and falling, and swineherds drove their charges into the woods to forage for them, a process known as pannaging. Pannage rights were generally paid for by a small cash fee on top of a peasant's normal dues, and provided a valuable means of fattening swine up for slaughter. Pannaging generally lasted for six weeks, ending in mid-November. Whatever wild fruits and nuts were available were also collected for human consumption. Wheat stubble, which had been left standing in the fields, was gathered in to mix with hay as winter fodder. Rösener, Werner Peasants in the Middle Ages (Polity Press, Cambridge, 1992). Unless otherwise indicated on the page in question, the photographic images reproduced on this site belong to the Witheridge Archives, and, as such may not be reproduced for commercial purposes without written permission. However, you are welcome to use any of the photographs belonging to the archive for personal and/or non-commercial use. Any material shown as not being owned by the archive may not be reproduced in any form without first receiving written permission from the owner of the material in question. The article, The Medieval Farming Year Version 1.0, is copyrighted to Andy Staples and I am grateful for his permission to reproduce his work on this site.this article on this site. Thank you Andy.